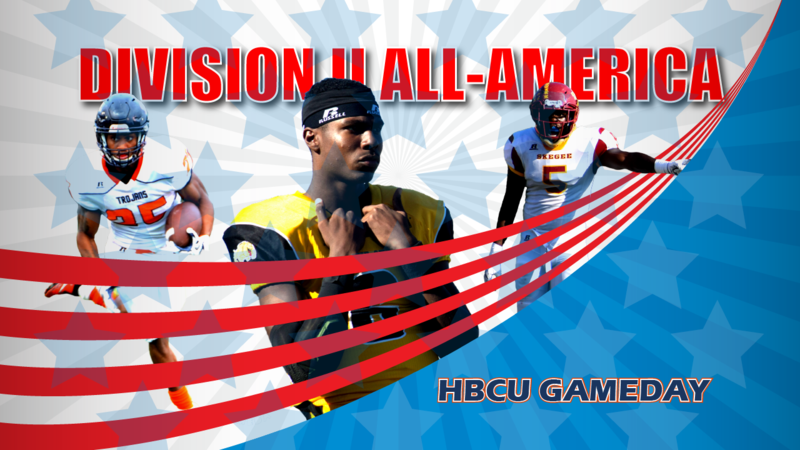 HBCU Gameday’s 2017 Division II HBCU All-American Team is here, representing the best of the CIAA and SIAC. The Division II football season is over for HBCUs, but its taken a while for us to figure out who in the CIAA and SIAC as well as other schools outside those conferences stand out. Only one player, Tuskegee’s Osband Thompson, was named to the AFCA All-American team. But HBCU Gameday exists to recognize the talents of HBCU student-athletes that might go unnoticed otherwise. QB Amir Hall, Bowie State: Harlon Hill finalist threw for 41 TDs and over 3,500 yards. RB Trenton Cannon, Virginia State: Cannon ran for 1,638 tackles and 17 scores as a senior. RB Rob Chesson, Bowie State: Chesson went over 1,300 yards rushing. WR Brandon Britton, Bowie State: Britton caught 68 passes and scored on 14 of them. WR Lansana Sesay, BSU: Sesay averaged a ridiculous 24 yards per catch and scored nine TDs. TE Rodney Morris, Clark Atlanta: Scored on six of his 28 catches. DL Jalen Cousar, Fayetteville State: Had 18 tackles for loss and five sacks for FSU. DL Sean Copeland, Bowie State: Anchor in tough Bowie defense. LB Osband Thompson, Tuskegee: 131 tackles. Four picks. Potential defensive player of the year. LB Brandon Lynch, Virginia State: 19 of his 84 tackles were behind the line. LB David Smith, Morehouse: A solid all-around defender, Smith had six sacks. DB Sterling Hammond, Virginia Union: The CIAA Defensive Player of The Year picked off five passes. DB William Flowers, Bowie State: Picked off three passes and broke up eight for the year. DB Carlo Thomas, Johnson C. Smith: Despite teams throwing away from him, Thomas picked off three passes and recorded 64 tackles, adding 8.5 tackles for loss. DB Quantaye Battle, VUU: Had 10 tackles for loss as a DB to go along with three picks. K Gene Carson, Bowie State: Hit 77 percent of his field goals and kicked in 77 PATs. P Nick Christansen, Miles: Christansen averaged 39 yards per punt. KR Cannon: Cannon averaged better than 33 yards per kick return and took two the house. PR Flowers : Flowers averaged 12.7 yards per return and scored twice. RB Stevie Green, FSU: The Broncos workhorse ran 225 times for 1,257 yards. WR Sam Boyd, St. Aug: A true redzone threat, Boyd caught nine TDs, including the game-winner vs. WSSU. WR: DeAndre Jackson, Clark Atlanta: Caught 44 passes for five TDs. WR Andre Price, Lincoln: Averaged 17 yards per catch in his 48 receptions. DL Alexander Williams, Virginia State: Recorded 6.5 sacks for VSU. DL Jack Nimmons, Winston-Salem State: Had 4.5 sacks and 11.5 tackles for loss. DL Jerrell Timmons, Elizabeth City State: Registered 7.5 sacks and 14 tackles for loss. LB James Hickman, St. Aug: 92 tackles and 3.5 sacks on a suprising St. Aug squad. LB Anthony Hardy, Miles: This hard-hitter went for 86 tackles and 11.5 for loss. LB Vincent Thomas, Elizabeth City State: Thomas had 83 tackles, 16 for loss. DB Shakym Peters, VSU: Peters broke up 11 passes and picked off three. DB Jonah McCutcheon, Tuskegee: McCutcheon picked off three passes for ‘Skegee. DB Cameron Young, FVSU: Picked off four passes and led FVSU with 72 tackles. DB B.J. Harrington, ECSU: Harrington picked off four passes for ECSU. K Christansen: Hit 13 of 15 field goal attempts. P Matt Trau, FSU: Trau averaged 40 yards per punt. KR Brandon Smith, FSU: Smith took two kicks back to the house. PR Canard Brown, WSSU: Brown scored on kick and punt returns in 2017.